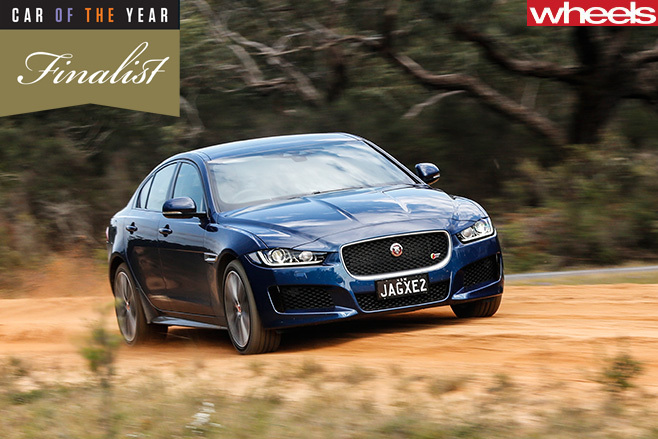 The dynamic brilliance of Jaguar’s XE made it a compelling choice – and it almost won. WE ALREADY knew the XE was good. Even before its launch here last September, overseas drives indicated this Jaguar had the talent to be a real premium medium-class contender. Performances in local tests and comparisons, when they came, only reinforced that view. 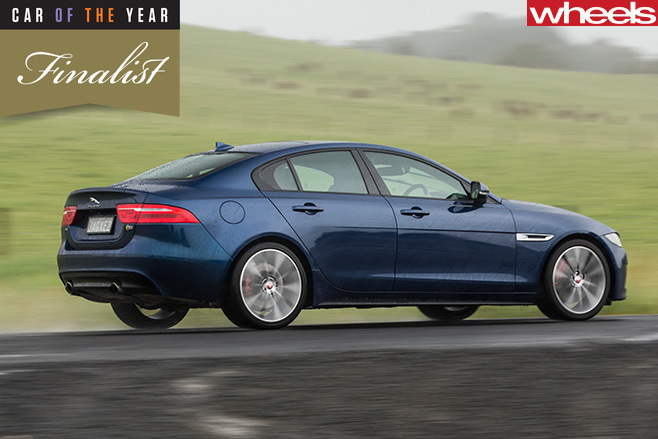 Now we also know the XE is one of the outstanding cars of its year. The Wheels COTY test program is tougher than any normal road test. It’s a week-long search for weakness. It’s guaranteed to find faults and flaws, and the XE was no exception. But this was also the car which emerged as the strongest challenger to our winner. Jaguar’s stated mission was to create a car more sporty in spirit than its mostly German competition. And the British brand nailed it. More than a C-Class or a 3 Series, the XE is a car engineered to enchant those who enjoy driving. The Jaguar’s electrically assisted steering provides a silky sense of connection and control. Equally alluring is the finesse with which this Jaguar treads the ride and handling tightrope. 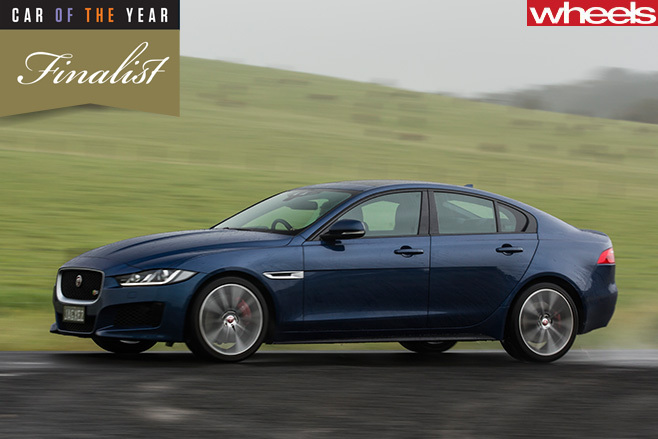 The XE’s chassis is perhaps at its best in the least costly and most basic Prestige grade. The 20d model in this specification supplied for COTY testing was impressive, both at the proving ground and on the road. Choosing R-Sport, which has a distinct chassis tune, adds a dose of discipline to the damping. While the handling benefits are tangible, there’s remarkably little loss of ride suppleness. It was disappointing that the use of aluminium hasn’t made it lighter. Although the metal makes up more than 75 percent of the body structure, the finished result is really no lighter than its main rivals. But Jaguar’s engineers have delivered a structure of terrific integrity. Even at Lang Lang, where high body loads are generated when cornering, the XE never showed the slightest sign of flex. The all-new Jaguar Land Rover 2.0-litre turbo-diesel introduced in the XE provided further proof of engineering expertise. While some judges noted the noisiness of the Ingenium from outside, there were no complaints from behind the wheel. Inside the car, the engine is satisfying; quiet, smooth and torquey. It also co-operates in unobtrusive harmony with the ZF eight-speed automatic that’s used in all Australian-spec XE models. And the sub-8.0L/100km consumption during COTY’s briskly driven public road loops was pretty impressive. 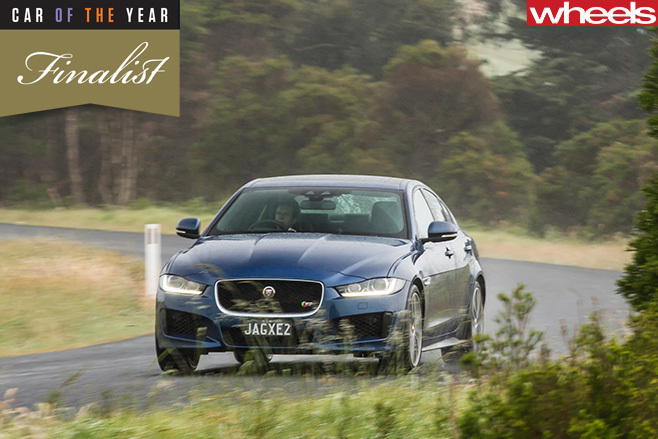 Both the 147kW 20t and 177kW 25t versions of the XE’s 2.0-litre turbocharged petrol were also judged to be good things. These Ford-made Ecoboost fours might be a stopgap measure until JLR’s own petrol-burning 2.0-litre turbo Ingenium comes on stream in 2016, but they work very well. It’s the thirsty supercharged 3.0-litre V6 of the range-topping S that’s the least convincing engine. This Jaguar-made unit is the same as that used in the base F-Type. While the engine’s performance is properly lusty, most judges noted the negative effect the heavier V6 had on the XE’s sublime balance. While the XE’s exterior is sleek, its 40/20/40 split backrest makes the XE a reasonably versatile load carrier. The boot, though smaller than rivals, is at least a neatly regular shape. But that stylish silhouette dictates a rear door aperture shaped to make access awkward. Once inside, the rear seat is adequate rather than excellent. Headroom and toe room are average and there’s a real shortage of storage space. Same goes for the front half of the cabin. Jaguar’s space-consuming pop-up gear selector dial in the centre console contributes to the problem, but why do the cupholders and door pockets need to be so shallow and narrow? Yet these aren’t the main reasons the XE’s interior is its greatest weakness. No COTY judge thought the cabin conveyed the same classiness and elegance that its engineering finesse and exterior style do. Quality perception is at the very core of premium-brand appeal, and the XE’s interior falls short. But pure driving pleasure is also an essential ingredient, and here the XE stands tall. As a consequence of this conundrum, scoring the Jaguar against COTY’s Function and Value criteria was difficult. 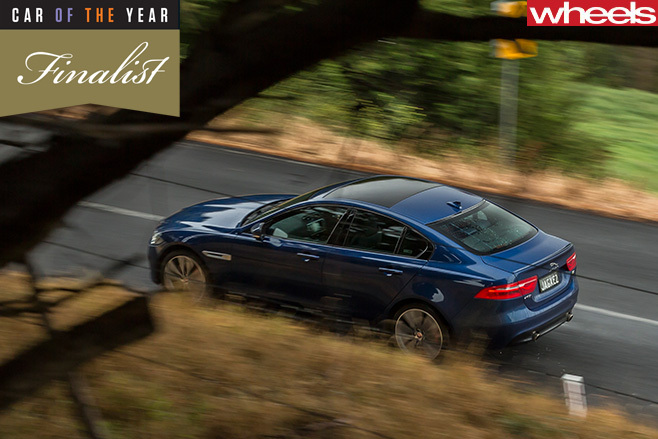 It earned solid ratings for Technology, Efficiency and Value, so there’s a question to be asked: Would the XE have won Wheels COTY 2016 with a different, better interior?